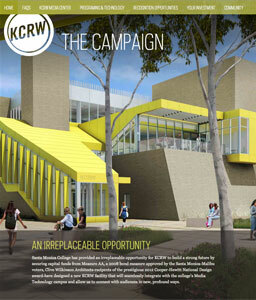 KCRW has a once-in-a-lifetime opportunity to move from their cramped basement home to a new, airy, eco-friendly, and beautiful space built just for them and their needs. 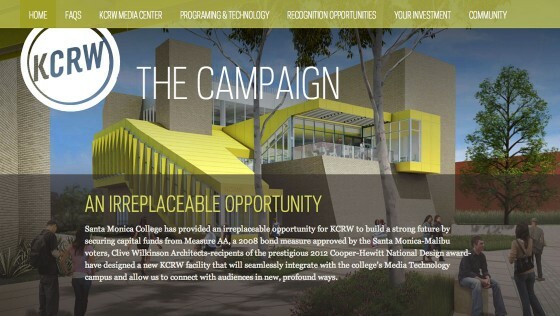 A gorgeous case statement and some other print collateral had already been created for the campaign, but they were in need of a website. The website would serve not only as the online home of the campaign, but also as a presentation tool for meetings and events. 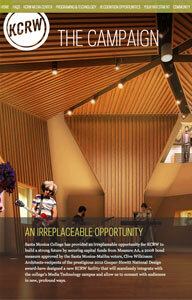 The case statement served as inspiration for the color scheme and typography of the new site. 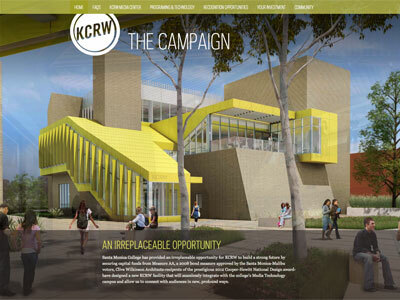 The website tells the story of the campaign, the story of KCRW’s history, and KCRW’s need for the room to grow, evolve, and adapt to the changing world of media. We built the site on WordPress to be easy to update as the campaign progresses through several phases over the next couple of years.